How should you buy a pressure cooker? Purchasing a good quality pressure cooker requires both time and money—but you'll reap the benefits in the forms of both good health as well as savings. 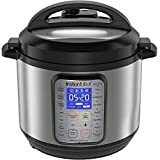 In the recent times, pressure cookers have undergone quite a few notable changes, which deserve consideration when you go to buy this handy kitchen apparatus. 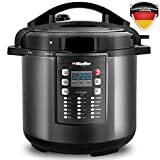 We have compiled some useful tips after going through thousands of pressure cooker reviews on the Internet so that you can select the right one for your needs. What should you consider when buying a pressure cooker? 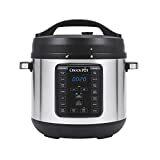 The market is flooded with many types of pressure cookers. But with this guide, you will be able to zero in on one without getting confused. 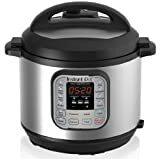 Check the types of pressure cookers: Choose between an electric, gas, or induction-top pressure cookers, based on the type of oven that you have and your preferences. 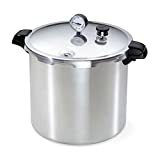 Check the material: Opt for a stainless steel pressure cooker instead of an aluminum pressure cooker. Stainless steel is more reliable, strong, and durable. 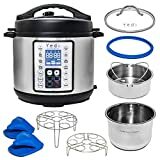 Look at the speed of cooking: Consider buying a gas stovetop pressure cooker if you are particular about the speed of cooking. Gas appliances are faster than their electric counterparts. 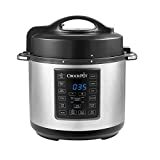 Ensure convenience: Choose an electric pressure cooker if you want to automate most of your cooking. Unlike gas stovetop cookers, you don't have to monitor an electric cooker throughout the entire cooking time. 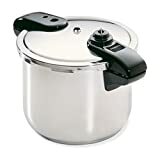 Go for a cooker with a secondary valve: Opt for a pressure cooker with a secondary valve, in order to ease the release of pressure quickly when in a hurry. Check the size of the cooker: Decide on the size of the cooker based on the size of your family. While a 4-6 liter size is ideal for a small family, 8-10 liters will be sufficient for larger families. 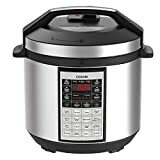 Look at advanced features: Opt for a pressure cooker that has a host of additional useful features. 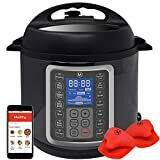 The modern pressure cookers come with safety features such as a locking lid, a lid vent, auto-shut off, and many others, so that you can enjoy cooking without any hassles.